Our basic strategy for raising children, teaching students, and managing workers can be summed up in six words: Do this, and you'll get that. We dangle goodies (from candy bars to sales commissions) in front of people in the same way that we train the family pet. Unfortunately, attempts to manipulate people with incentives ultimately fail and even do lasting harm. Drawing from hundreds of studies, Kohn demonstrates that people actually do inferior work when they are enticed with money, grades, or other rewards. What's more, they tend to lose interest in whatever they have been manipulated with rewards to do. Over the years, this groundbreaking book has persuaded countless parents, teachers, and managers that rewards and punishments are actually two sides of the same coin, and it's a coin that doesn't buy very much. Kohn explains what it means to work with people instead of doing things to them-at home, at school, and at work. 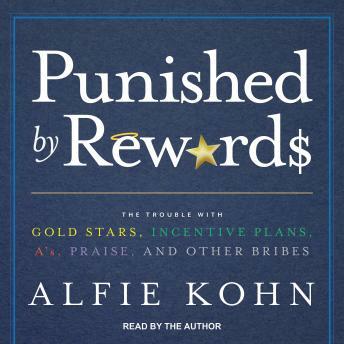 Seasoned with humor-and containing new studies and stories in an Afterword written for the book's revised edition-Punished by Rewards presents an argument unsettling to hear but impossible to dismiss.